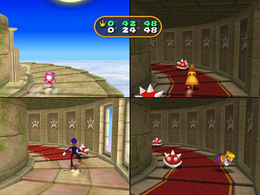 Fun Run is a 4-player minigame from Mario Party 7. The first player starts out running in a spiral castle-like area and jumps over a Spiny Shell. The screen splits into four screens to show all the players. The players must then run to the finish line dodging Spinies, trap doors, and mechanical punching walls. Spinies stun player for a short time, trap floors have the player fall and lose more time than Spinies, and mechanical punching walls push players out the stage, having them lose the most time. Spinies and trap doors can be avoided by jumping over them. Players can avoid the mechanical walls by approaching them until they thrust. Then, they can jump over the horizontal pole that pushes the wall. The first one to the finish line wins. The scenery changes from day to night as the players advance to the finish line. This is one of the minigames that can appear in Decathlon Castle. Here, the player's objective is to get to the goal as fast as possible to earn as much points as possible, up to a maximum of 1,000. The winner does their victory animation atop the tower. Rules – "Run for the finish line at the top of the tower, but don't hit any obstacles!" Advice – "Move carefully! There are hidden traps in the walls and floor!" This page was last edited on March 27, 2019, at 01:12.